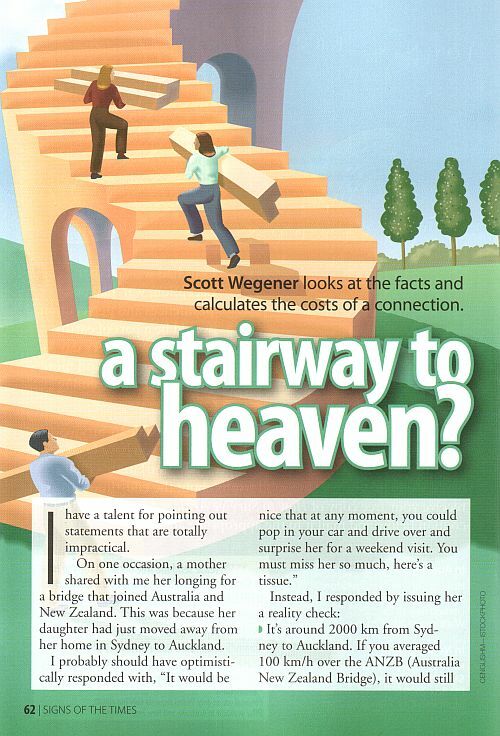 Scott Wegener looks at the facts and calculates the cost of a connection. I have a talent for pointing out statements that are totally impractical. On one occasion, I had a mother share her longing for a bridge that joined Australia and New Zealand. This was because her daughter had just moved away from her home in Sydney to Auckland. It’s around 2,000km from Sydney to Auckland. If you averaged 100km/h over the ANZB (Australia New Zealand Bridge) it would take at least 21 hours to get there - including an hour to stop for fuel, food and toilet breaks. Even if you happened to own your own Formula One car, at a speed of 300km/h it would still take you more than 7.5 hours of driving time and pit stops to arrive. The 2000km trip will probably require two fuel stops on the bridge. Fuel would cost at least $10 per litre out in the middle of the sea, making two fill-ups of an 80L tank cost $1,600. As far as construction of the ANZB, nothing comes close to the distance and depth this bridge would have to span. The current record holder for the longest bridge in the world, the high speed rail Danyang–Kunshan Grand Bridge in China, is 160km long and a mere 35m or so above land. It cost around $50 million per kilometre to build. However, unless we get some serious global cooling, the ANZB will not be build over land but instead have to span the Tasman Sea, which averages about 3.5km deep. The tallest bridge in the world so far, the Millau Viaduct in France, is just under 350m tall and cost about $200 million a kilometre to build. So, using the height and distance to cost ratio of these two bridges, I estimate the ANZB would cost $800 million. No, not in total - per kilometre! At 2000km in length, we arrive at a grand total cost of $1.6trillion dollars – excluding GST. Due to the cost, there’s no doubt this bridge would be tolled. If the Sydney Harbour bridge toll is about $3 for a distance of about 1 kilometre, the toll for a crossing the ANZB would start at $600. As for a weekend visit? Assuming this mother left Friday afternoon at 6pm and had to be home and on her way to work by 6am Monday morning, and slept a mere six hours on each of the three nights, she has a 42hr window of conscious time to holiday in. What does all this mean for our loving mother? The weekend round trip drive from Australia to New Zealand and back would take 42 hours and cost $4,400 in fuel and tolls, leaving our mother with around 44 seconds to give her daughter a kiss and hug before she starts trip home again. That’s a $100-a-second visit with her daughter - and she’s 44 seconds late for work on Monday. The good news is we have something called airplanes. For less than quarter of the cost, and about six hours of travel, you can have eight hours of sleep each night and still have around 30 hours with your loved one, at a cost of less than a-cent-a-second. Why on earth would you use the bridge? 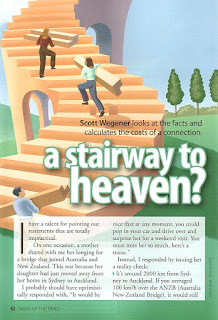 I hope this mother doesn’t also wish there was a stairway to heaven so she could ask God to look after her daughter. I’m not even going to begin to try and calculate the inconceivable costs and ludicrous speeds you’d have to travel to reach Heaven. The numbers are [ahem] astronomical! While we have planes that can cross oceans quickly and inexpensively, we also have prayers that can cross the heavens at no cost and no travel time. I can highly recommend both!